It being Constitution Day only meant that government offices and banks were closed, and some of our tamale-going group didn’t have to work. Candelaria in Oaxaca City is all about carrying dressed-up ceramic baby Jesus in a chair all day (see more about the holiday in Jesus Gets a Lab Coat). Also, if you got the plastic baby Jesus in your piece of rosca de reyes (kings’ cake) on January 6, you’re supposed to provide tamales and atole for your friends on Calendaria. Pretty much any excuse for a party. Though who knows who really got the plastic Jesus in their cake, several of us En Via administrators and guides were invited to Cecelia’s place in San Miguel to eat tamales. To say Cecelia is a force of nature would be like saying an F-5 tornado has a little power. She could be running, say, a small country somewhere in the world with her brains, drive and ability to pull people together. 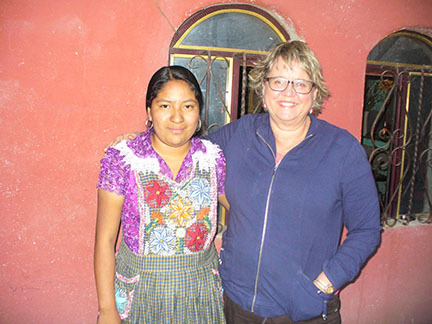 Instead, she keeps a very firm hand on her corner of the world, a town of about 1,500 people on the skirt of the mountain on the road up from Tlacolula. 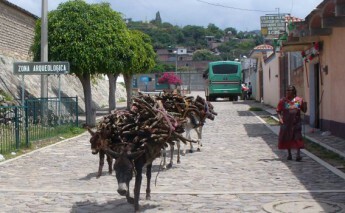 It’s a world of the past, where burros stagger under loads of wood on the winding road and the women wear elaborate pleated dresses with lace collars and ruffled, embroidered pinafore-style aprons. All day, every day. Never pants. But it’s also a world of today where many of San Miguel’s men are working in el norte to send money to their families back home and the market women have cell phones glued to their ears just like everywhere else. 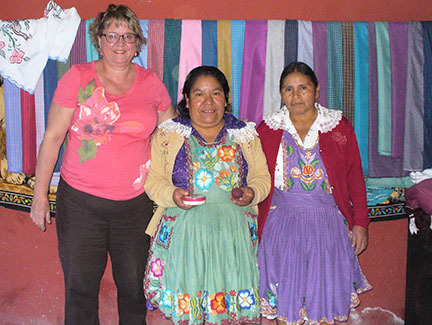 Though En Via had been providing microfinance loans to several surrounding communities – first starting in Teotitlan del Valle in 2010 – Cecelia vetted us out for about a year before she was ready to commit to a program in San Miguel del Valle. And then she had a group of a dozen women ready to roll and do business. It’s been the fastest growing of En Via’s microfinance programs, thanks in large part to Cecelia. She watches over her girls (18-year-old Maria Nelly really is her own daughter) like a benevolent madam. They watch each other’s backs. They socialize together, laugh together, joke about men to each other when they think no one’s listening. 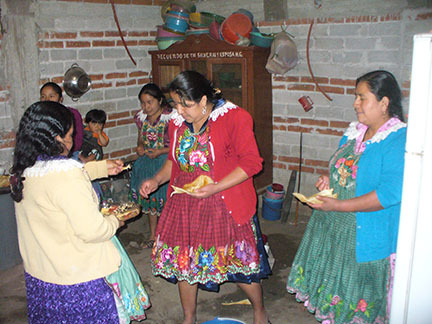 Almost all of the women are seamstresses, making either traditional dresses, aprons or both – though there are a few tortilla and chocolate makers in the borrowing groups. 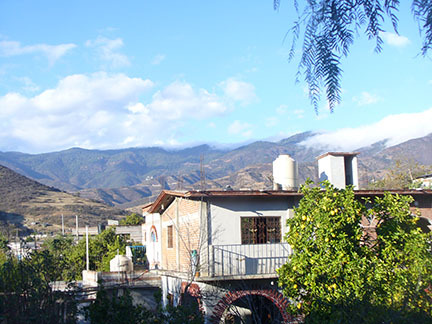 On February 2, we arrived by van to Cecelia’s house perched on a hill with stairs down to a lower courtyard, a huge pot of atole bubbling over a wood fire. The name comes from the Nahuatl (Aztec) word atolli, and like many Latin American food and drinks is corn-based. 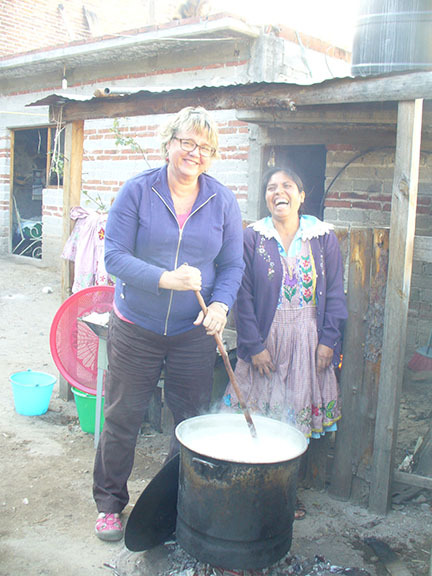 We gringas got a chance to stir the atole with a huge wooden spoon to the laughter of the San Miguel ladies, our upper arms wearing out after just a few stirs and our eyes watering at the wood smoke. The tamales were yellow, laced with chicken and just spicy enough. While we had spoons if we wanted them, the San Miguel women ate theirs delicately with their fingers, a smidgeon at a time. (“They taste better with your fingers,” whispered the woman sitting next to me.) 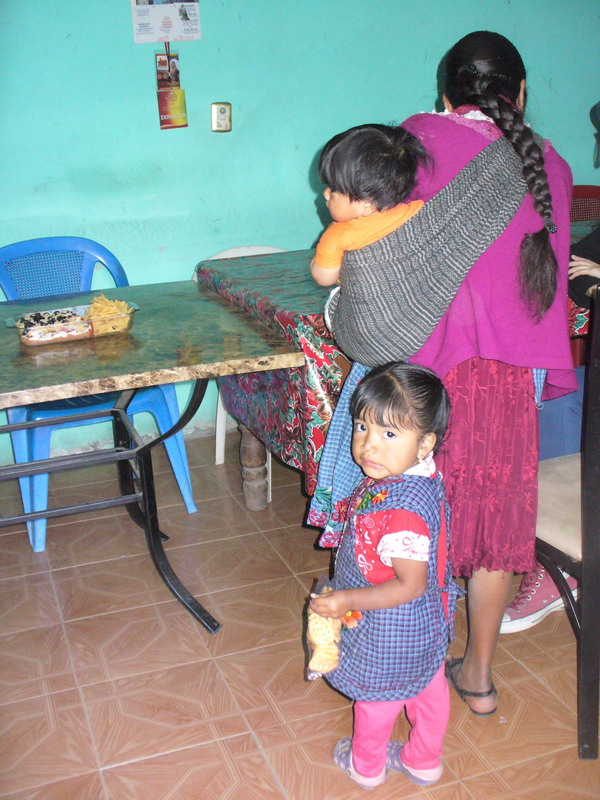 Several of the young women had babies in their laps, tied on backs in a rebozo, or tied in front if discreetly breast-feeding. They asked about the ingredients in the foods we’d brought to share: Sam’s seven layer dip (beans, cheese, avocado on chips, my zucchini bread: who would think to put calabacita in sweet bread?). Cecelia sent Maria Nelly with me up to her workshop to alter my two aprons whose back ties didn’t quite go around my back. 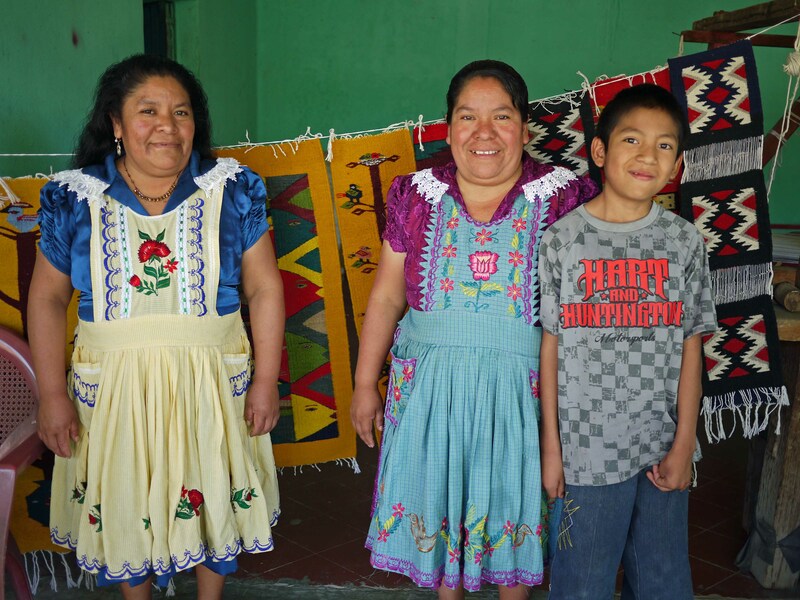 To be fair, adult women in San Miguel average about 4 ½ feet tall, so at 5’6” I’m a giant. My personalized apron, a gift from En Via for the years of volunteer work I’ve put in here, says “Chef Susan,” so I wasn’t about to get a different one, just needed a bit more fabric. Cecelia came up to supervise, tsked a bit and measured the waist (which needed to drop a good six inches) and said she’d have it ready in a week or so. Meanwhile, the fiesta – as good parties always seem to do – gravitated to the kitchen where a group of women talked, laughed, nursed babies and were getting a little rowdy (besides the atole, there were thimble-sized cups of mezcal being passed around). Yeah, the floor was dirt and there wasn’t an electric appliance in sight, but it was a great kitchen (see more about gracious entertaining in Hospitality, Mexican Style). Before we left, someone passed around chicharron-like crisps and mandarin oranges to take with us. 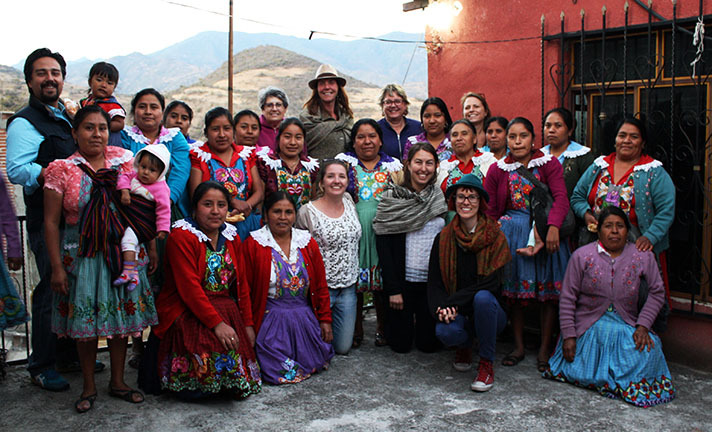 We took a group photo, we gringas – even the short ones — towering over the San Miguel women by a full head or more. 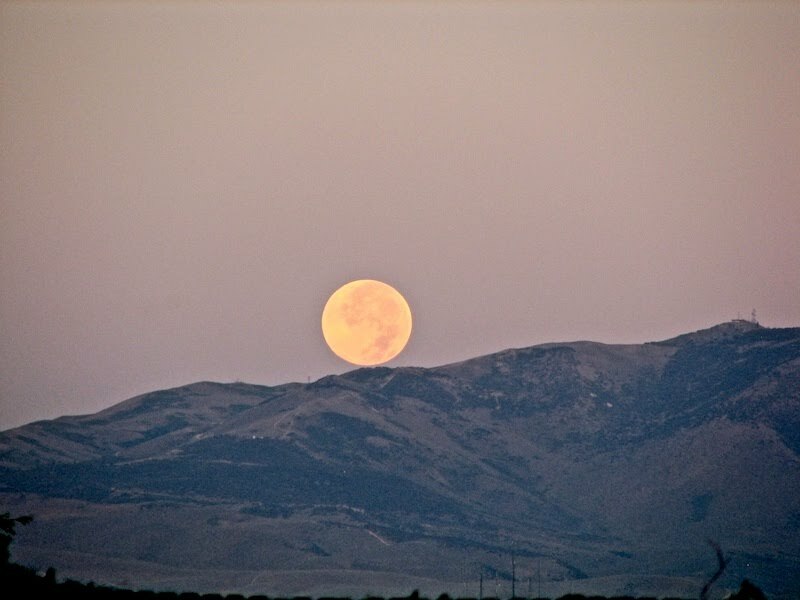 Driving out of town, we pulled off the road to get a good look at the full yellow moon rising over the mountains, behind us the lights of San Miguel starting to twinkle in the deepening night. Mica went ahead and howled at it for all of us. In a large saucepan, whisk the water or milk into the masa flour little by little until completely mixed and free of lumps. Heat over meadium heat, stirring constantly, until it just begins to thicken. Add piloncillo and cinnamon stick or ground cinnamon. Scrape seeds from vanila bean into pan or add vanilla extract. Stir vigorously until sugar is dissolved, then bring to a boil, stirring constantly to keep it from becoming lumpy. Remove cinnamon stick. Serve hot in mugs.